Q: "[D]id [Randy] Walker run the zone-read at Miami (OH), like when he upset the Wildcats their Rose Bowl year, or was it something he introduced in Evanston?" The short answer is no, he didn't become a "spread guy" until he was at Northwestern. But the details are the fun part. Rodriguez invented the zone-read. Some others have said they dabbled in it before he did, but all signs point to his having invented it while at Glenville State. Rodriguez had been a four-wide spread guy with the zone run game, and it just kind of happened. 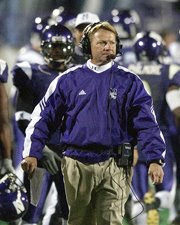 Walker, by contrast, had run traditional offenses at Miami of Ohio and early in his tenure at NW. In 1999, Walker's first year with the Wildcats, the offense was bad and the team went 3-8. He, along with his longtime assistant Kevin Wilson, who is now the offensive coordinator for Oklahoma under Bob Stoops, visited Rodriguez and Tommy Bowden at Clemson and Mike Martz at the Rams. I believe they got a little bit from Martz in terms of general theory, protections, and the like, but the lasting impact was Rodriguez. This was because what Rodriguez showed them was less a new way to attack the problem of good defenses but more just a new way to think about attacking the problem. Rodriguez showed them the shotgun and the zone read stuff they were doing at Clemson and had done at Tulane, but the reason it clicked for Wilson and Walker is that they realized that they could run all their old stuff -- the zones, the power, counter, option, etc -- all from spread sets. And this was probably the great leap forward for the spread. Indeed, if you look at what Rodriguez was doing at Clemson, a lot of it is there in terms of the zone read, but a lot of it too was just Woody Dantzler running around. It was Walker that took the idea of "spread-to-run" and "zone-read" and systemized it. Again, Rodriguez had been a spread-to-pass guy originally, who just had this one really big idea for the run game. Walker and Wilson brought to it the traditionalist tinkerer mindset, as guys who had been coaching power, run-first football for years and were experts at blocking schemes, defensive fronts, and the like. It was this marriage of the grand-new spread ideas with an old school attention to detail that helped Northwestern go 8-4 and beat Michigan in 2000, and it is this that guys like Urban Meyer and half the high school coaches in the country learned the bread and butter from. And Rodriguez's sharing with Walker had a kind of pay-it-forward effect to him, as he then began seeing how he could improve his spread-to-run offense, which became more solidified and systematic while he was at Clemson and particularly when he was at West Virginia, with Rick Trickett as his line coach. This is why Walker deserves as much credit as Rodriguez for taking the spread mainstream. He showed how coaches could pretty much do what they already did -- and apply the lessons they'd already learned -- to a new environment, and to new success. I was at that epic Northwestern v. Michigan game in 2000 (54-51). I was a fan of neither team - just happened to be in Chicago that weekend hanging out with some friends - but I was just enthralled with the Wildcats' offense. We knew we were seeing something amazing, but never could have grasped at the time how evolutionary it was. Great post. Wow, Chris, thanks for the impressively detailed response. One minor quibble with what otherwise was a GREAT article. As a fan of a team that was abused by Bowden/RichRod/Dantzler I think they were more advanced than just the zone read stuff with regard to the spread offense even before NW. In particular even in Dantzler's first year they were allready running tons of tackle counter out of the gun both with the QB and RB and that play as much as the zone read was a killer. I think I even saw them running some of this at Tulane, but I could be wrong. Great article. I'm looking forward to your response to Brad. You almost make it sound like RichRod just happened upon the spread and didn't quite know what to do with it. Seems to me RR deserves more credit than you're giving him. RR's record with the spread is more impressive than Northwestern having a passable year (astounding for them) and beating Michigan once. How do you turn around losing programs, several times as RR has done, almost overnight, without having the offense "systematized." Are you being entirely fair here? what losing program's did RR turn around? Tulane? Was not head coach. Clemson? Was not head coach. West Virginia? Losing program? He made them one before he turned them around. Michigan? Yea..a Real big losing program. He has admitted to stumbling upon the zone read play. He has had success with it, but he is not the Messiah of losing programs. Very interesting I enjoyed the article. I have a question, what would you call the air force offense, spread, flexbone, mix, what? And could you break it down....please. Rodriquez is not getting his due here. Why have coaches all around the nation gone to RR for advice on the spread during the off-season. Walker went to him too. I've never heard mention of coaches consulting Walker for spread advice. Michigan's WAS a losing program -- and steadily getting worse; that's why Carr was replaced. "I've never heard mention of coaches consulting Walker for spread advice." michigan's A losing program? That's ridicolous. They defeated the defending Nat'l Champ in thier last bowl game. The year before had a chance to play in Nat'l title game in the game with OSU.